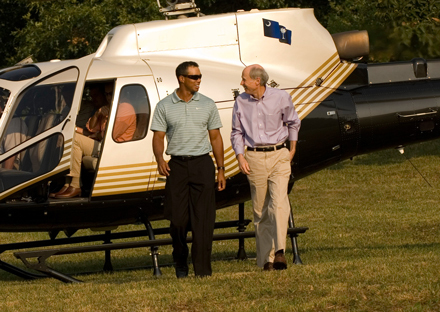 Asheville, N.C. – Tiger Woods showed life of his old golfing self this weekend at the AT&T Pebble Beach National Pro-Am, but his first golf course design project in the United States remains dead in the high-profile Cliffs Communities. At least that’s the foreseeable future for the proposed High Carolina private golf course community now under the ownership of Steve and Penny Carlile, the Texas couple who announced plans last week to acquire most of High Carolina developer, The Cliffs Communities. News of the Cliffs Communities change in ownership means another high-flying developer of luxury private golf course communities, Jim Anthony, has gone bust. The Cliffs, based in Travelers Rest, S.C., has eight luxury private golf and resort-style communities centered around golf courses or planned courses in South Carolina and nearby Asheville. In the case of the Cliffs’ newest project, Woods’ High Carolina, the 3,000-acre golf course development remains unfinished and only two homes have been reportedly built. Fewer than 50 of a planned 1,100 lots have been sold. The Carliles and Cliffs founder and President Jim Anthony announced last week that The Cliffs subsidiary that owns and runs golf courses, clubhouses and other community amenities will declare bankruptcy and Carlile Group will seek bankruptcy court permission to buy it. Officials said Carlile Group will take on the job of marketing the home lots owned by the various bankrupt Cliffs subsidiaries, although Steve Carlile was quoted as saying ownership of the lots will vary on a case-by-case basis. High Carolina is dear to the Carlile family, considering Steve Carlile owns one of the best ridge-top homesites on the property. The Carlile’s originally purchased a lot in the Jack Nicklaus-designed Walnut Cove community in 2008, but they decided to build a home in High Carolina once Tiger Woods announced the Cliffs was going to be his first U.S. golf course design project. Soon after, the Great Recession hit and the Cliffs’ high-end real estate market all but vanished. Despite efforts to raise capital from his various property and club owners, Anthony succumbed under the pressure of various creditors forcing the sale to Carlile. Overall, Anthony said the eight Cliffs developments were planned to contain a total of 9,500 lots and about 4,500 have been sold.